Sometimes officials in a match get criticized too much – but the New England Revolution vs New York Red Bulls match on Friday night was not one of those occasions as the officiating made an obscene bungle that snowballed into several more mistakes almost at the same time. On the play in question, Red Bulls defender Kemar Lawrence went down on the pitch with a non-contact injury but Juan Agudelo charged past undaunted even as Lawrence called for a stretcher. But the officials allowed play to continue and while the Red Bulls players tried to figure out why play wasn’t being stopped, Agudelo made an easy pass to Diego Fagundez that he quickly converted for a goal – the only one of the contest it would turn out as New England won 1-0. Lawrence ended up requiring medical attention and was stretchered off, adding yet more suffering to the Red Bulls night. The bad officiating didn’t end there as officials simultaneously yellow-carded GK Luis Robles for dissent and later issued a straight red card to MF Felipe Martins for grazing a Revolution player. 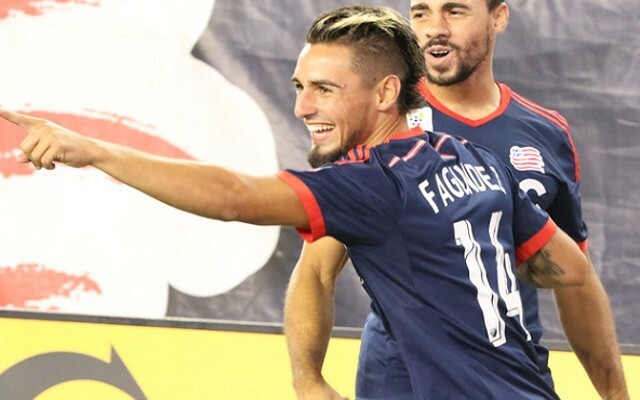 Diego Fagundez and Juan Agudelo may have been all smiles, but make no mistake: They got away with highway robbery by being allowed to make a play on that ball. If the U.S. Soccer Federation doesn’t say something about that awful officiating, perhaps the Revs won’t be so happy when one of their players gets hurt and non-calls are made.